Thursday May 24, 2012 I fly fromFort Myers,Florida to O’Hare in Chicago. My friend Sue who is also my former sister-in-law picks me up around ten in the morning. We eat at Cracker Barrel on the way toLadd, Illinoiswhere she lives. This is part of my planned trip: Fly into Chicago, Sue picks me up. We swing by my brother’s place in LaSalle to pick up his truck. His name is Steve but since high school his nickname has been Scrub. More about him later. His truck smells like an ashtray as he is an avid smoker. It has been sitting in the sun and I gag as I get behind the wheel. By the time I drive it to Sue’s house I feel as if every bit of that smoky smell has melded onto me. Before I lock the truck up for the night I douse it with Hawaiian Aloha air freshener I’ve borrowed from Sue. Friday May 25th, as planned I load my luggage in the truck and pick up Scrub and away we go to Sarcoxie, Missouri, an eight-hour trip. We leave at seven a.m. I have to drive all the way because Scrub can’t drive due to some legal issues. I don’t particularly want to do any of this, fly and then drive a truck for eight hours with a destination of Sarcoxie,Missouri, but I’m doing it anyway. My mother is from Sarcoxie and owns a house there. She’s almost blind and nearly deaf and has some other medical issues. She lives in an assisted living facility in Carthage, Missouri and her house has been unoccupied for two years. Scrub and I plan to empty out a storage unit which holds many of her belongings, moved there by our brother Kevin when he lived in her house before he died two years ago. There’s plenty of room in the garage and I want to go through some of the things that have been in storage before we leave on Monday. Time is ticking. We arrive at the house around four p.m. to find the narrow front porch nearly invisible beneath an overgrowth of a vine. While I wait for Scrub to get his act together so we can go to the storage unit I find clippers and start chopping the vine back. Scrub finds that our aunt has left a key on the counter with a note. Off we go. The key does not open the lock on the storage unit. Great. Scrub has brought his tools and he douses the lock with WD-40 and works on it some more, uses some pliers to hang on to the key and wiggle it or force it. The key won’t turn. Damn thing isn’t opening. Do we have the right storage unit? He’s fairly certain it’s number fifteen, but we try another identical lock on number ten. It doesn’t open either. Maybe we need better lock lubricant. We go down to the hardware store where two old guys are sitting in rockers and nobody else is there. They listen to our tale of woe and agree there are other lubricants but if it was them they’d use WD-40. Yeah, we’ve tried that. It’s not working. Thanks for your help. We go back to the house to search for another key. I double check the paperwork. Number fifteen is the correct unit. I also find two key rings with a bunch of keys on each. In the kitchen I read the note my aunt left on the counter with the key we’ve been trying to use. “Key to lock on shed” she has written. Shed? You mean that little red barn my dad had behind the house for his lawnmower and tools? 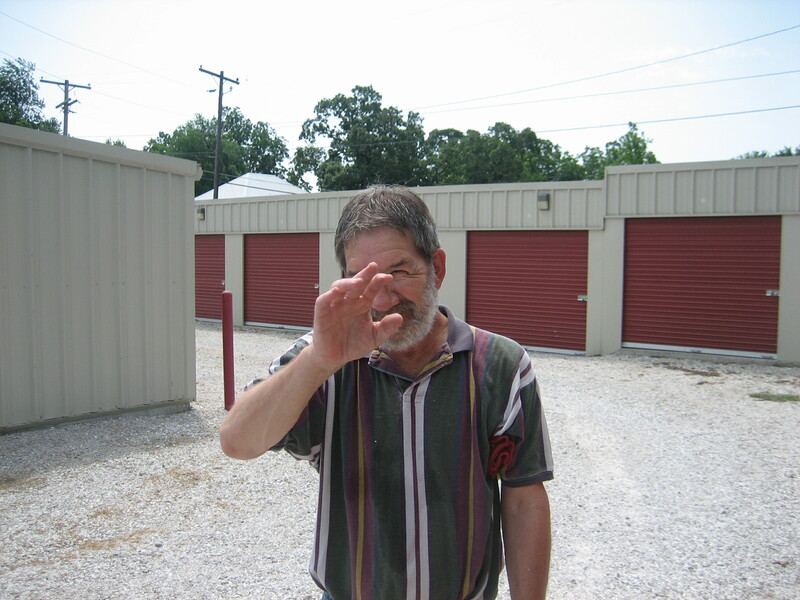 Um, Scrub, this key’s for the shed not the storage unit. I hold up the key rings. Maybe one of these will fit it. Off we go (again) to the storage unit. We find the correct key on one of the key rings and open the door. We are greeted with a dusty hodgepodge of furniture, boxes and odds and ends. What a mess. The two of us are going to have to move all of it. A sofa. Bedroom furniture. Mattresses. But not until tomorrow. We’re tired and hungry. We are also dismayed to discover the small package store on the corner that’s been there for as long as we can remember appears closed. Scrub is disappointed but unconcerned since he left a supply of vodka, grapefruit juice and salt at the house on his last visit. I am more perturbed and think I should have stopped by Wal-Mart before I left Illinois and stocked up on white zin. I wasn’t too happy at the idea of paying the package store’s high prices for it, but I’d have bitten the bullet and done it. I fear I’m screwed. There is only one grocery store (with a limited, grossly overpriced, and questionable quality of food items) in town and they don’t sell alcohol. There’s a Subway out near the highway, though so I head that way to pick up dinner and find the convenience store/gas station next to it sells white zin. I find an unfamiliar label priced at $4.99. Joy. We got into the storage unit and I’ve located a local source for reasonably priced white zin. God has officially blessed our mission. addiction, barbara meyers, family therapy, Illinois, Missouri, relationships. Bookmark.